We decided to take it easy today after running around in the bush yesterday. After looking at the images we took and loading our update this morning we decided to just take a drive in and around Homer. Of course the only camera we decided to take was the little G9. Because we found something we needed the larger camera and lens for; an eagle’s nest with an eagle sitting in it. There it was just off the road near the airport. The interesting thing was we had passed this spot several times before without ever noticing anything. 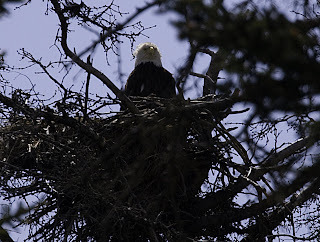 We decided to return to the nest armed with the 1Ds III and 400 DO with a 2x extender. 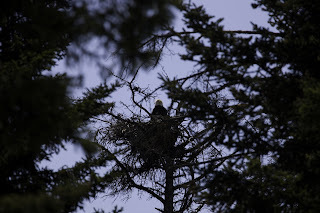 The first image shows the original untouched; while the second is a crop of the nest and eagle. As near as we can tell we were shooting approximately 200 plus yards away. Thank you for the great post card. My #1 wish is that I was with you. The Eagle with his talons just leaving the water is awesome, awesome, awesome. This is my #1 bird, followed by the Heron, which is what that other bird looks like, the one with the long neck. But the Eagle pictures are all just beautiful. I can feel/hear them flying overhead almost.... In fact, they all are great. Keep up the story telling and keep the pictures coming. I almost feel like I'm on a vacation, but somehow I never get to LEAVE THE BUILDING. Oh well, I love what you're doing.